Japanese Society of Physiological Anthropology publishes 2 journals. Today’s highly technological environment, which is developing rapidly, is having a profound effect on the human community, not only in terms of lifestyle and culture, but also with regard to the physiological capabilities of the human body. 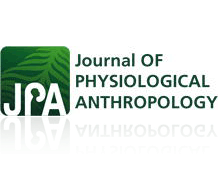 The original academic objective of JPA and JJPA was to focus on evaluating physiological adaptations to modern living environments. Research personnel from various fields of natural science on human beings submit their discoveries and findings to JPA and JJPA. Since Vol. 31 (2012), the Journal of PHYSIOLOGICAL ANTHROPOLOGY (JPA) has been provided by BioMed Central as an open access journal. Please access the new JPA web page hear to submit a manuscript or view articles published in the Journal’s after Vol. 31. All articles before Vol. 30 are available at no cost on J-STAGE. The Japanese Journal of Physiological Anthropology is issued four times in a year. The contents of the publication are original, review, report, brief communication, technical report, discussion & answer, and others. A special issue of a research group sometimes appears. Manuscripts are accepted for consideration with the understanding that they have been submitted solely to this journal and that they have not been previously published, either in whole or in part. Members of the editorial board are responsible for acceptance of manuscripts and publications. Membership in the society of the first author is prerequisite for publication.